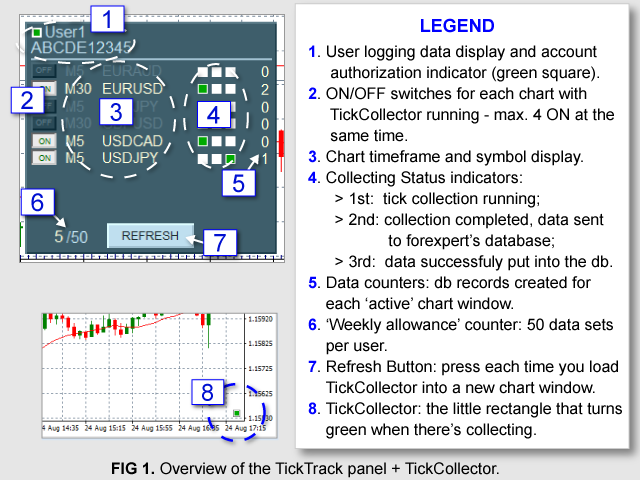 Utility robot that works with TickCollector indicator to get and send tick and order data to the database at forexpert.co.uk. The data is used to create special charts for you to analyze your trades. This product cannot be used on its own, you have to get TickCollector (free) to be able to use the (TT/TC) system. To try the system, get TickTrack TryOut (it's free). Color Theme (choice of 4). To use the system, you have to create a free account at forexpert.co.uk (once there, click LOGIN/REGISTER button and fill the 'Register Form') - you'll get a 10-character User Code which you'll need, along with your chosen User Name, for the TickTrack to connect with the site (note that you won't be able to log in to the 'demo', check out TickTrack TryOut first!). 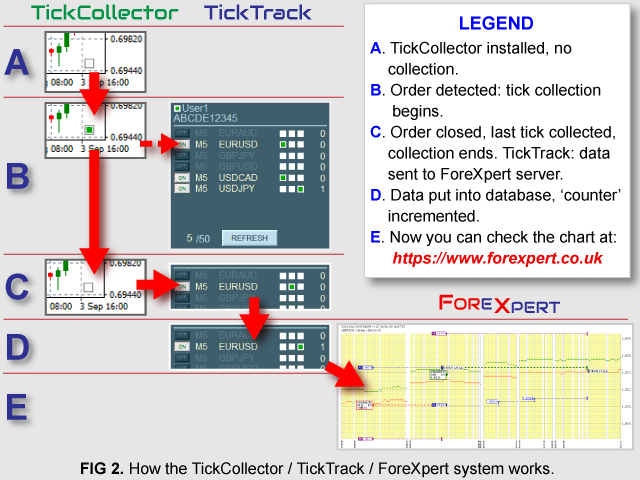 Then, install TickCollector-s on the chart(s), click REFRESH button on the TickTrack panel and it will connect with all the TickCollector-s.
For the TickTrack to be able to send data to the ForeXpert database, you have to add 'https://www.forexpert.co.uk' to the list of allowed URL-s in MetaTrader4 Terminal (Tools - Options - Expert Advisors - 'Allow WebRequest for listed URL' - 'add new URL like...' and add the address to the list). 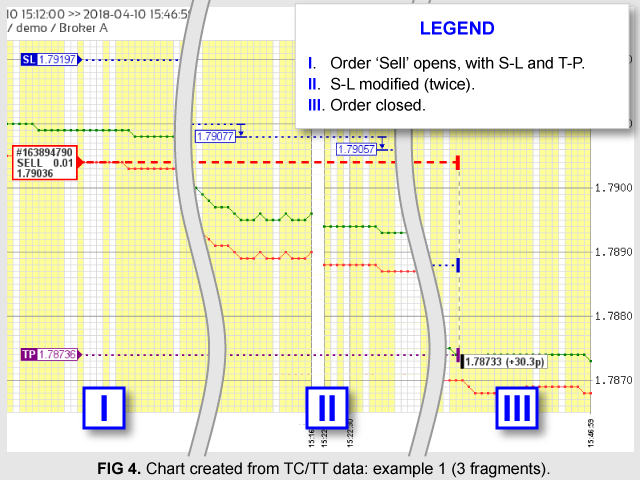 You can have TickCollector-s running in 8 chart windows but the TickTrack can only control up to 4 charts at a time. Use the ON/OFF switches on the panel to select the charts you want the data for. 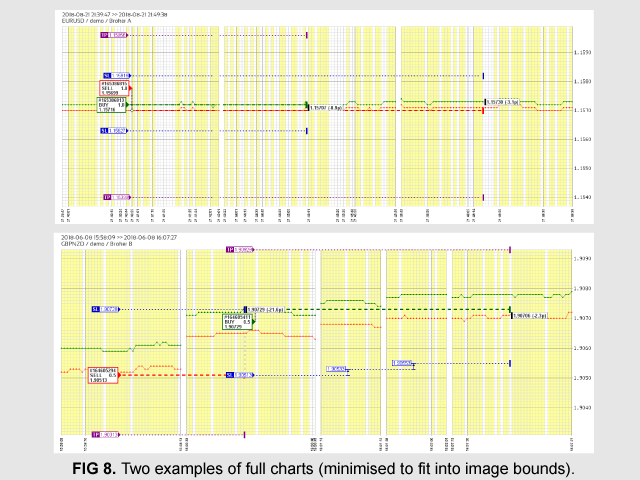 There can only be 1 chart window with TickTrack in the Terminal, and you don't need more. The best way is to install it in the window for a pair you do not trade (as you wouldn't be able to use another EA in the same window) and, from there, the robot will control the TickCollector-s in other windows. TickCollector collects 'chunks' of data with tick prices every time it detects: a new order, stop modification and when the order is closed. After collection done, it creates a temporary file with the order and tick data. 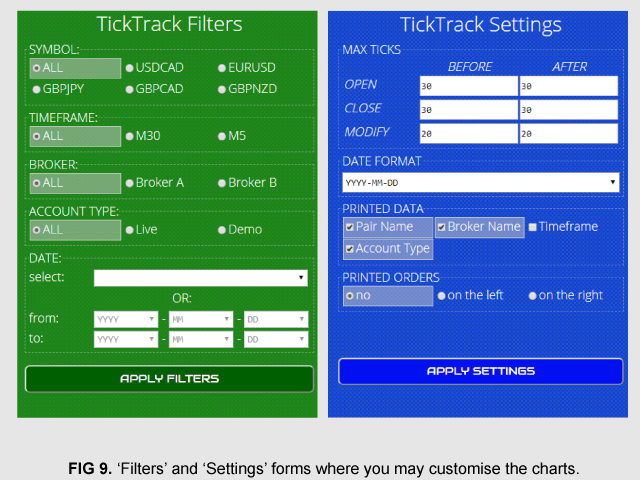 TickTrack detects the file and sends its contents to ForeXpert database. The data collecting is only made in windows for which the ON/OFF switch is in the ON position. However, if you turn it OFF while there's collecting pending, the collecting continues until the last order is closed and data sent out. In the robot panel there you can monitor the status of data collecting in chart windows. In each row for a Symbol, there is a ON/OFF switch, chart Timeframe and Symbol Name followed by 3 little square objects showing for 'collecting' status: first one turns green when data is being collected, middle one when collection ended, data sorted and sent to ForeXpert; the third one indicates that data has been put into database. The last element is the data counter for the chart: it shows how many database records have been created during current session (check out the diagram FIG 1). Click REFRESH button if you install TickCollector in a new window. The diagram FIG 2 describes how the whole system works. 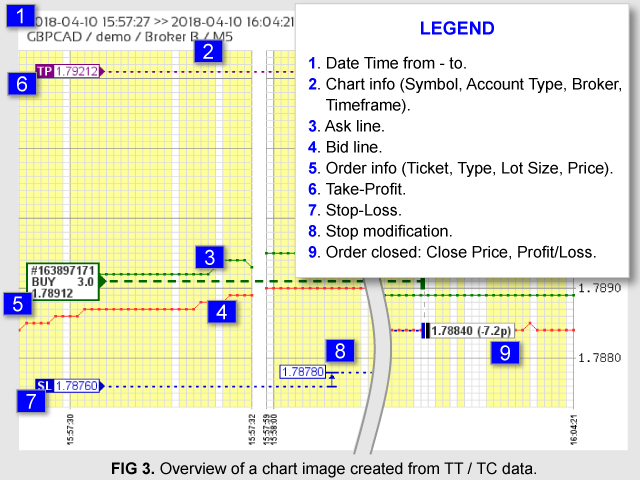 In the lower-right corner of the diagram there's a miniature example of a chart created by TT/TC system as displayed in the ForeXpert website. 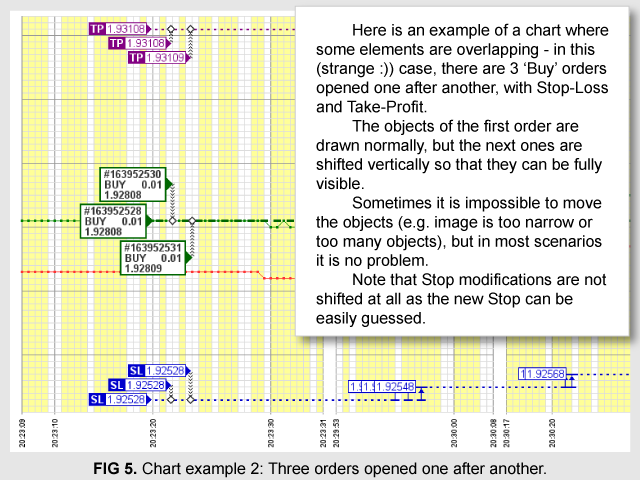 The graphics FIG 3 - FIG 8 show how the charts created by TT/TC system look like. 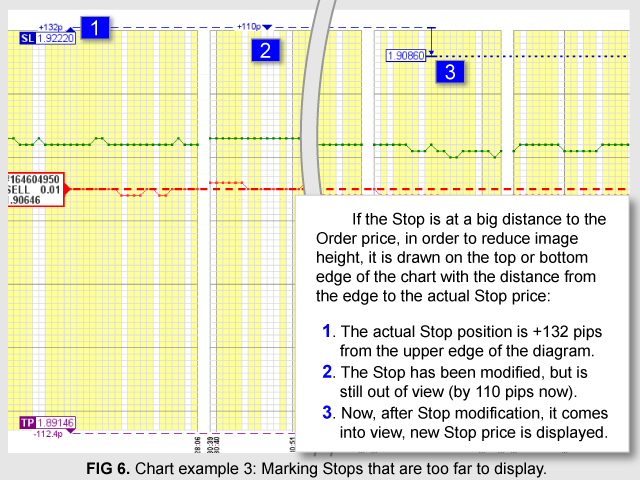 If you want to check out the whole charts, go to forexpert.co.uk/my-robots/TickTrack/examples - there are some charts I've created when working on the system. There is a limit for sets of data that can be created and put into database: 50 per week. If you reach the limit, you will not be able to collect new data until the next week. If the limit has been reached and there are some orders still open, the collecting continues until the last order is closed and data sent out. 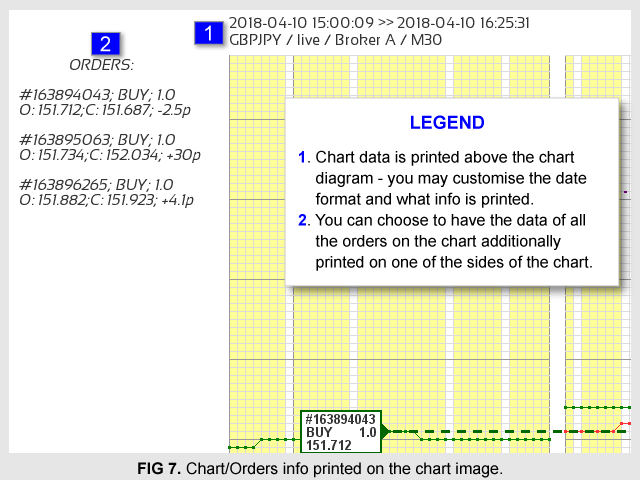 On the website, there are forms (FIG 9) which you can use to display charts only for selected Symbol, Broker, Date/Time period etc. and to customize the look of the charts. This product is a part of a (TT/TC) system. You have to get TickCollector Indicator to be able to use the system. You can only install TickTrack robot in one chart window. The TT/TC system creates folders in MetaTrader file system: 'TicksData' (for temporary TC files) and 'Errors' (for temporary error log). All files from these folders are sent to the server and then deleted. This is not a trading robot so it cannot be tested in Strategy Tester. To test how it works, get the free version: TickTrack TryOut.